Dog lovers gladly accept the many responsibilities that come with owning a little fur baby. Fortunately,we live in a digital age with tons of resources at our fingertips. 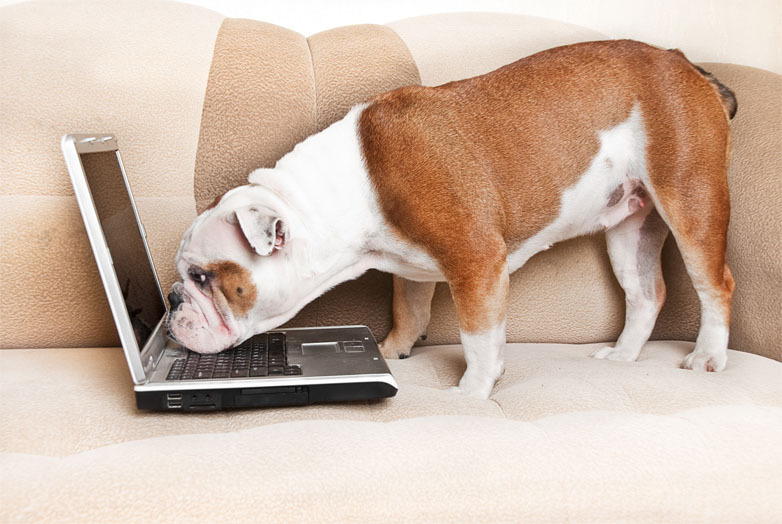 Here are some of the best and coolest ways that your dog can use the Internet! If you’re anything like me, you’re absolutely crazy about your dog. I love my little fur baby. He’s a little Shih Tzu mix named Vincent (after my favorite painter, Van Gogh). What a sensitive little soul he is! Poor little guy is a rescue dog with separation anxiety. As soon as I adopted him, I started digging online for resources to help with behavior training and daily pet to-dos. There’s a ton of stuff out there – great tools to help you and your dog live your best lives together. Aww. Here are some cool ways your dog can use the Internet. Separation anxiety (SA) can be a pain. If your dog has SA, you have my sympathies. It’s tough. For those of you who don’t know what this is, consider yourself extremely lucky. People who leave home for work can come back to pure chaos – home destruction and even pet injuries. There is a great channel on YouTube called Relax My Dog with videos of hours’ worth of calming music. Music tracks feature sound sweep technology that emits a high-pitched noise to hold your dog’s attention to the music. These tracks can help with SA, sleep issues, reducing hyperactivity, soothing during thunderstorms, or even comforting sick or injured pups. I took a road trip recently with my dog, and this channel helped keep him calm for the journey. When I leave for work in the mornings, I leave these videos playing on my iPad. Extremely helpful. Trust me; it works! There’s a company called DOGTV that provides innovative audio-visual therapy tools for dogs with SA. It’s a 24/7 digital TV channel featuring content specifically developed to keep your fur baby relaxed and happy. Videos are color-corrected to compliment the dog’s sense of vision. How cool is that? The channel is available through XFINITY, DirecTV, ROKU, Amazon Fire TV, Apple TV, and RCN. The app is available on Google Play. Check to see which local Internet bundles include access to this resource. All this may seem a bit extra, but if you have any experience with SA, you know what a godsend this can be. Also, there are some great nature videos on YouTube for your dog to watch. They have videos of squirrels and birds and other fun stuff that will hold your dog’s attention. I tried this just the other day with Vincent, and he sat and watched attentively as assorted forest creatures flitted across the screen. Simply magical. This is a good video to check out, and so is this one. I’ve spent a small fortune on my dog. Food, crate, leash, toys, treats. I could go on and on. It can really add up. Honestly, I think I’ve probably spent more on my dog than I have on myself. No regrets here, though. Like I said, I'm absolutely dog crazy! Any opportunity to save money is highly appreciated. The two biggest retailers for pet products are Petco and PetSmart, and they both do price matching from their own websites. Yes, that’s right! You can match the price of a product to the online price, which is sometimes considerably lower. Next time you are in the store, give it a try. I keep my phone in hand as I browse the aisles, looking up products on their website as I go. I pull up each product on a new tab on my browser so that when I get to the register I just show the clerk my phone. You can save some serious money. Petco offers a handy Repeat Delivery service. I find this especially useful for purchasing food and other products that my dog needs on a consistent basis. You set the delivery frequency schedule. Shipping is free, and you get 20% off your first order with the promo code “rdsave20”. You can always pause the service if you need to. Also, adding stuff later to your order does not incur shipping fees, even if those items ship separately. Super duper convenient! Subscription boxes have become all the rage - everything from clothing to food to shaving supplies. Need something? There’s probably a box for that. BarkBox is a subscription service for your dog. Every month, your dog will receive a box of goodies. Talk about spoiling your pup! The service curates a collection of toys, treats, and other products based on theme. Every month is a new theme, like Chewrassic Bark (dinosaur stuff) and Sniffin’ Safari (lions, hippos, and banana cookies). So fun! Boxes are valued at over $40, but the subscriptions start at only $21 per month. You know you wanna! You can order all your pet medications through 1-800-PetMeds, the largest pet pharmacy in the United States. Get everything from heartworm medication to vitamins to allergy relief. I’ve dealt with this company and found them to be extremely helpful. For prescription medications, they will call your dog’s veterinarian and coordinate the delivery. You can always call their customer service line during business hours if you have any questions. Every time that I have called, the reps ask me how Vincent is doing. They genuinely care which is pretty cool. What dog owner doesn’t love dining out on a patio with their pup on a warm summer day? If you’re traveling with your pet, you’ll want to know which hotels are pet-friendly. BringFido is the ultimate online resource for finding places to eat, stay, and play with your dog. Find nearby dog parks, hiking trails, beaches, shopping areas, campgrounds, local events, and more. This website is amazing. You can read through reviews to find the best accommodations. If you need help planning a trip, there is 24/7 support to help you plan and book your next pet-friendly vacation. No booking fees. You have to admit that’s kind of neat. For people on the go, Wag! is an app that can help you find dog walkers, sitters, and boarders. Who are these people exactly? They are your local community members who have been screened for handling experience. The site vets handlers and tests their experience levels. These people are available on-demand so you can hire according to your schedule. Rover is a similar concept. You can find dog walkers, boarding, house sitting, drop-in visits, and doggy day care services. Can’t get away from the office to take your dog out to poop and pee? Don’t stress. Rover has you covered. Search through local handler profiles and find someone near you to help. Easy peasy. There you have it. These are some of the most helpful sites online for your dog’s needs. Being a dog owner is challenging. Fun, but challenging. With the right support and tools, it can be a life-enriching experience. Seriously. I love my dog. I know you love yours. We all want the best for our fur babies. Fortunately, we live in a digital age where tons of resources are right at our fingertips. There are plenty of doggy resource websites and apps that I haven’t mentioned here. Share your favorites in the comment section. I’ll leave you with a corny joke. What did the dog say to the tree? Bark.